Extra nice playing double lap steel guitar. 3 way togle switch. All you need to do is tune them. I will also include a gig with the guitar. Erickson pedal steel guitar,a great guitar very well made, birds eye maple 10 string e 9th tuning two pedal one knee. Ready to play.has a very nick case to carry to your gigs. Just an outstanding very well taken care of guitar.i,m sure you,ll like this guitar. Ciao Amici. Questa lap steel che vi propongo in vendita è un modello veramente unico e particolare. La parte elettronica è composta da 2 pick-up, un humbucker e un piezoelettrico che sono controllati separatamente da due volumi. Ha un suono molto bello. Trovate la demo sul mio canale youtube. Dillion Professional Lap steel 8 in lemon drop. No one makes them better. Dillion is considered one of the best lap steel guitar builders in this price range. Dillion deluxe lap steel roller nut. 1 Dillion Alnico 5 pickup. Dear Mr. Dillion. I bought a DL 650. adding SEYMOUR DUNCANS,ETC,I could have had a HOUSE FULL of DILLION GUITARS for what I paid for an OVERATTED GIBSON! The solid mahogany body and the string-through-body design make for full, powerful sustain. A single Alnico P-90 pickup gives the Recording King classic lap steel tone. Gloss Sunburst Finish. OUR TECH'S HAVE TESTED, INSPECTED this Lap Steel Guitar. INVENTORY #34433. FUNCTION: Lap Steel Guitar. PHYSICAL CONDITION: Very Good - The Lap Steel shows moderate use and has various scratches here and there. The pickup cover shows oxidation and paint flaking. Marlen steel guitar with 8 strings and 5 pedals. He ended up not having learned to play it which is why we now have it. It is in great condition! The outer hardware on the case show the most signs of weathering/use through their discoloration. Carter Starter Black Burl 3X4 Pedal Steel Guitar W/ Gator Carry CASE! VGC!!! Carter Starter Pedal Steel Guitar! THIS IS an absolutely perfect beginners Steel Guitar! Emmons Pedal Setup! 3X4 Black Burl Laminate Finish! Beautiful E9th Nashville Tuning! Gator Carry Case and tuning wrench included! Very Good working Condition! Tuned and Tested! 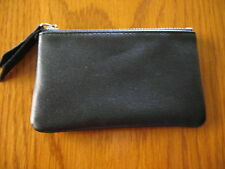 Made In:United States This item is sold As-DescribedThis item is sold As-Described and cannot be returned unless it arrives in a condition different from how it was described or photographed. This is our lovely, RARE 1955 Magnatone Troubadour 8-string lap steel with its original hardshell case. This is a ONE OWNER electric lap steel. The Troubadour was made by Magnatone for only one year. Ciao Amici e Amiche, questa che vi propongo è una trasformazione in lap steel Guitar di un orologio da parete, Ha tre corde, si accorda come una Cigarboxguitar, amplificato con un pick-up piezoelettrico. Ovviamente l'orologio e tutti gli strumenti sono funzionanti. Electro harmonix Holy grail plus. -Mxr phase 90. -Mxr gt od. Lot De Pédale D Effets X5 Guitare. -Boss fv500h. Vendu en 1seul lot. -Support pédales métal t rex. 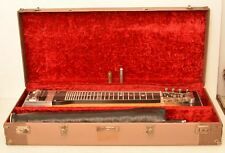 National Grand Console Double 8 from 1946 Steel Guitar/Lap Steel. Die gitarre funktioniert, ist im originalzustand unverbastelt, selbst die plexiglas pickup kappen sind dabei. Hat einen super ton. Gitarre ist laut vorbesitzer aus 1946, also wohl eine der ersten. Koffer ist in keinem guten Zustand funktioniert aber, wurde an einer ecke repariert (siehe fotos). Ebenso wurden einzelne tuner buttons ersetzt weil porös und zerbröselt..... weitere identische buttons sind dabei so dass man alle gleich hat.... Die Steel ist sehr schwer habs nicht gewogen aber knapp 20 kilo denk ich deshalb der etwas höhere versand. am liebsten vorbeikommen und anspielen! Zustand: Gebraucht Versand mit DHL Paket bis 10 kg. The Airline LAP STEEL is a tribute to the National Lap Steels produced by the Valco in the late 1950s – early 1960s. This new model is a more formidable version, featuring great tone and balance. Make’n Music is happy to have the Airline Lap Steel guitar for sale at a great price. It is in great functioning order. Will need new strings and a setup. We don't know a whole lot about these and can't set it up (not sure of the tuning nor if the strings were the correct ones). Dillion is considered one of the best lap steel guitars in this price range. Dillion deluxe lap steel roller nut. 1 Dillion Alnico 5 pickup. But I hand pick each one myself at the Dillion factory. Great Guitars! Gotoh Lollipop Relic Aged Nickel Bass Tuners. Mid 60s Spec! Set of four Gotoh FB30 open-gear tuning keys. Gotoh FB30-LP-N L4 Classic Bass Tuning Keys. Most designs have bearings attached to the plate in a way that can cause the worm screw to misalign with the worm wheel. Features: C 6th neck & E 9th neck. make Supersized seem small. Get images that. The cream hexagonal knobs are intact and the playing surface has original screws with multi-colored heads substituting for fretboard dots. There is light wear only on the bottom binding of the console base, and the steel is otherwise remarkably clean, right down to the original felt on the bottom. – Double Bound Top Maple, Rosewood, and Bloodwood Purfling and Side Maple Purfling. 4 BAND EQ/ Pickup. I obtained this Weissenborn and it sounds pretty great. EQ and Pickup is installed and functioning perfectly. EQ & Pickup Installed. Rosewood Ply Back and Sides. Maple Top Ply. Maple Binding. 2x4 Lap Steel Guitar Kit - the DIY Electric Slide Guitar: You Supply the 2x4! Lets you build a playable, great-sounding instrument! The matching amp is a Gibson GA-50T with original foot pedal. Hands down. This amp is covered in brown leatherette, boasts 25w with 1x8" and 1x12" speakers. The speakers have been upgraded and, with the added Tremolo circuit-OH MY GOD! Eastwood Guitars Ricky Lap Steel Cherryburst Vintage Rickenbacker-inspired NEW! Eastwood Guitars Ricky Lap Steel - Cherryburst. Cherryburst Finish. 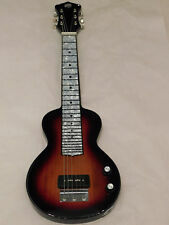 Make’n Music is happy to have the Eastwood Guitars Ricky Lap Steel for sale at a great price. Don’t see what you’re looking for?. Give us a shout or stop by to browse our massive selection. Condition is New. M ay be ideal for other steels. Sugartone Starjet Lap Steel Guitar. We are an authorised dealer for Sugartone Guitars. These are superb handcrafted guitars, built entirely in the UK, probably the best lap steels currently available on the market. The OPEN D SLIDE RULE CHART is an 8.5"x 11" laminated chart showing every note in every key over the neck.The tuning is D-A-D-F#-A-D. F or instance, a bove each fretboard are 4 related keys. The area on the end are the open strings. The OPEN G SLIDE RULE CHART - GBDGBD is an 8.5"x 11" laminated chart showing every note in every key over the neck. F or instance, a bove each fretboard are 4 related keys. The area on the end are the open strings. PICKUP WORKS FINE( STRONG 7.56k), ADJUSTABLE POLES, NO CRACKS IN BOBBIN. Kaka’ako ‘Style 4’ Solid Mahogany Weissenborn. – Ebony Fretboard with Custom Abalone Inlays. – Rope Binding (Maple & Rosewood). Our High end Mahogany Series Model, very beautiful solid body with a traditional rope binding design. Bill Lawrence (RIP) 10 string Pickup. Maybe the best steel guitar pickup ever made. pedal steel guitar that got sold years ago. SGN Products. Complete universal mounting assembly for a Peterson StroboPlus or flip tuner to a pedal steel guitar leg, mic stand, music stand. The swivel lets you mount your tuner to any angle you want and still keep the tuner level. 440c hardened stainless Steel. This tone bar is made from 440c stainless, which is hardened. Super hard, produces a real sweet tone. Far harder than what is typically used for stainless steel tone bars. 3 x Premium Lap Steel Fret Boards. For 8 string steel guitars. Scale length: 24.5". 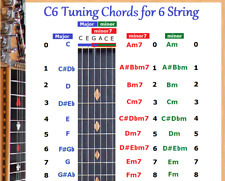 The C6 CHORD CHART FOR 8 STRING LAP STEEL DOBRO GUITAR is an 8.5"x 11" laminated chart. The tuning is G-E-C-A-G-E-C-A. All the Major, minor and minor7th chords on the entire neck 2 octaves of common chords. The C6 CHORD CHART FOR 6 STRING LAP STEEL DOBRO GUITAR is an 8.5"x 11" laminated chart. The tuning is C-E-G-A-C-E. All the Major, minor and minor 7th chords on the entire neck 2 octaves. The C6 CHORD CHART FOR 6 STRING LAP STEEL DOBRO GUITAR is an 8.5"x 11" laminated chart. The tuning is C-E-G-A-C-E. All the Major, minor and minor7th chords on the entire neck, 2 octaves of common chords. The E9 CHORD CHART FOR 8 STRING LAP STEEL DOBRO GUITAR is an 8.5"x 11" laminated chart. The tuning is E-G#-B-D-F#-G#-B-E. All the Major, 7th, 9th and minor chords on the entire neck 2 octaves of common chords. 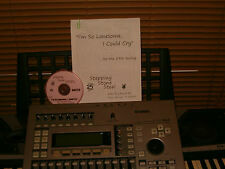 E9 CHORD CHART FOR 10 STRING PEDAL STEEL GUITAR - WORKS FOR LEFTY TOO ! The E9 CHORD CHART FOR 10 STRING PEDAL STEEL GUITAR is an 8.5"x 11" laminated chartshowing 48 chords x 12 locations. Included are: Majors, sevenths, minors and minor sevenths chords. The tuning is B-D-E-F#-G#-B-E-G#-D#-F#. 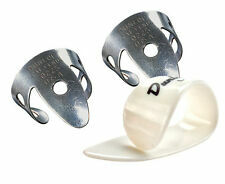 Perfect for Lap Steel Guitar, Pedal Steel, Resonator or Banjo. Jim Dunlop Pick Set XL. extra large shell Dunlop thumb pick. 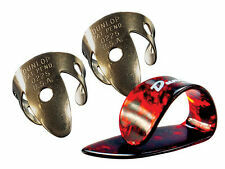 - Two Brass Dunlop finger picks, guage. 020. For those of us with big thumbs. With this kit you can create your own custom cables with right-angle plugs. Best of all, it is solderless! George L's. 155 Guitar Pedal Cable Kit. 155 Black / Black / Nickel - 10/10/10. 10' (ten feet) of. 155 cable in black. "ChordBoard" learning tool for the Pedal Steel Guitar. E9th tuning. Simply trim left margin to align frets on board with frets on your guitar. Can be creased and bent toward you for easy viewing (see insets). The tuning is C-E-G-A-C-E. All the Major, minor and minor 7th chords on the entire neck 2 octaves.